USC and the prestigious TED conference have partnered to deliver an independently organized TED event at USC. TEDx USC will stay true to the spirit of the TED Conference – hosting the world's most fascinating thinkers and doers, and challenging them to give the talk of their lives in 18 minutes or less. The half-day event will comprise of a mix of pre-recorded talks from TED 2009 in Long Beach and live talks. Sprinkled throughout & in-between the lectures will be short films, musical performances, and thought-provoking entertainment. Some of this year’s TEDx USC speakers and performers include a worldwide rock star that has sold more than 30 million albums, one of the creators of the most complex scientific instrument in history, and an inventor who is restoring sight to the blind. Plus several USC innovators that are changing the world in gaming, immersive environments, bioengineering, animation, and music. I had the pleasure to hear and see Elizaveta Khripounova perform at Hotel Cafe in Hollywood this past Thursday (03/19/09) evening. 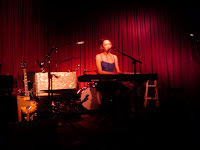 Hotel Cafe is one of the best venues in Los Angeles for live-music. Their focus is mostly on rock/indie-rock. There were four other musicians lined up Thursday evening, and all of them came with their own flair, skill, talent, and personality. I must admit though that Elizaveta's music, and her songs stood apart from the rest of the musicians. She brings passion and soul to each note and each of her lyrics. There is depth, clarity, and vision in her songs. If you listen intently and mindfully, she will take you on a roller-coaster ride of emotions. You will feel happy in one song, with a smile beaming across your face, while in the next one, you may feel sad, and lonesome. There are songs where you feel hopeful and optimistic about love, life and your career, and then there are songs where you are reminded of love lost, friends lost. Among some of the instruments that she used in her set included a regular electronic keyboard, a toy-piano, and an Indian harmonium. If you ever get a chance to hear her in the future, you must go and request the song where she uses the toy-piano. It was a real treat for my ears. Hotel Cafe is a mellow place, with subdued lighting, beautifully tiled floors, and a tasteful lounge once you enter through the main door which happen to be at the back of the building.